Happy Leftovers Day! Otherwise known in most places around the world as ‘Boxing Day’! 😉 I hope that if you celebrated Christmas yesterday, you had an enjoyable day. I enjoyed having family over for dinner, and cooking the traditional turkey dinner. Today it’s almost back to normal. Somewhat quieter today, and some family have the day off work. I’m back to share another sneak peek with you! This stamp is one of the FREE stamp sets that you can earn with a qualifying order during Sale-A-Bration, between Jan. 3rd and March 31st. The stamp set is called Heartfelt Blooms, and contains the large image stamp, plus 3 sentiment stamps. You’ll be seeing more of this type of stamp – it’s Stampin’ Up!’s new Distinktive stamps! They lay down the ink at different opacities, giving the finished image more depth. Just ink the surface lightly for a perfect photographic finish! Start by stamping the water image from the Waterfront stamp set in Powder Pink ink onto the Whisper White cardstock panel. Stamp it 3 times, to create a large enough background area for the floral image. Next, ink up the floral image from Heartfelt Blooms in Basic Gray ink, and stamp directly over the Powder Pink background. This allows you to see the different depths in the image, while also creating colour for the flowers. Ink the sentiment stamp with Berry Burst ink, and stamp onto Whisper White. Use the Big Shot and Stitched Shapes Framelits to die cut the sentiment. 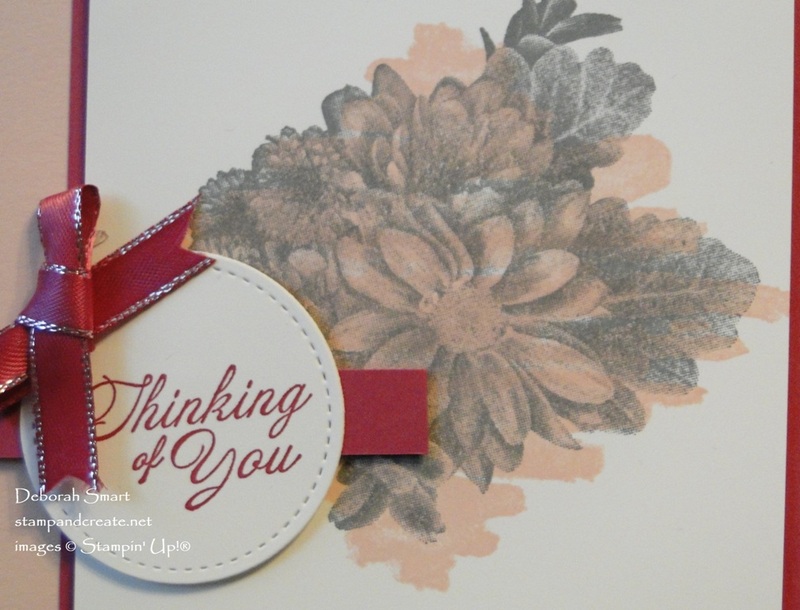 Cut a 1/2″ wide strip of Berry Burst cardstock, and layer it under the sentiment. Layer the image panel onto a 1/4″ larger panel of Berry Burst cardstock. Next, attach both panels to a card base of Powder Pink cardstock. 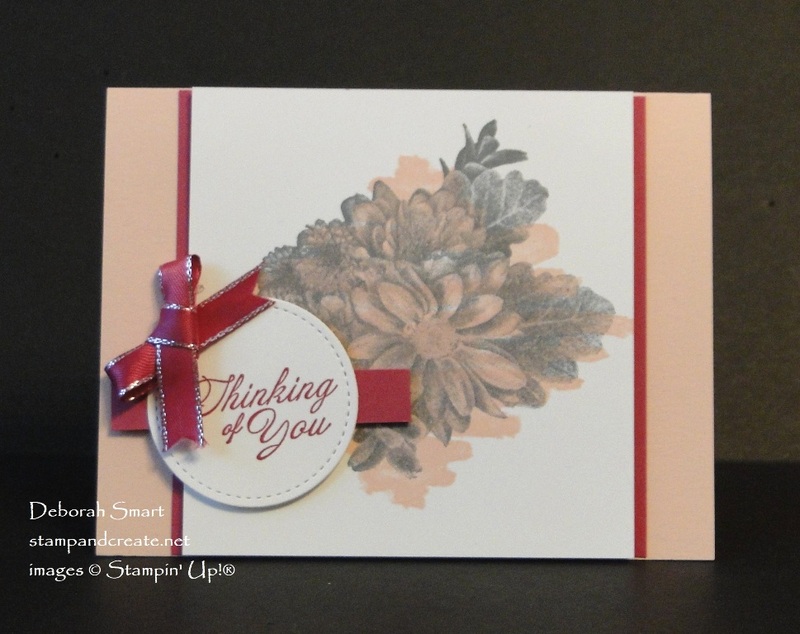 Layer the sentiment circle on top, to the left, with Stampin’ Dimensionals. Tie a bow with the new Berry Burst 3/8″ Metallic Edge Ribbon (from the new Occasions catalogue), and attach it with Mini Glue Dots. This new stamp set isn’t available to purchase – you’ll only be able to get it for FREE with a qualifying order during Sale-A-Bration! For this set, you only need to spend $60 (before tax/shipping) to get it for free. Your order can include any products; from the new Occasions catalogue, the Annual catalogue, and/or the Clearance Rack. WANT MORE FREE PRODUCT? HERE’S HOW! During Sale-A-Bration, hosting a party can bring you even MORE FREE PRODUCTS! That’s right – host a qualifying party of $330 or more, and you’ll earn not just your regular Host Benefits, but ALSO $35 MORE in Stampin’ Rewards! That’s an extra $35 in whatever products you want!! You can order the other supplies now, but the new ribbon won’t be available until Jan. 3rd, 2018. Click on the product images below to go to my online store. Previous Previous post: Wishing You A Very Merry Christmas! This is beautiful, Deborah. I love how you stamped the Waterfront stamp first and then the flowers over it. Gorgeous!